ABBYY Lingvo European quickly and accurately translates words and phrases without an Internet connection. 112 dictionaries for 7 languages (Russian, English, French, Spanish, German, Italian and Portuguese) are included in the application. All ABBYY Lingvo European dictionaries are licensed from leading international publishers. 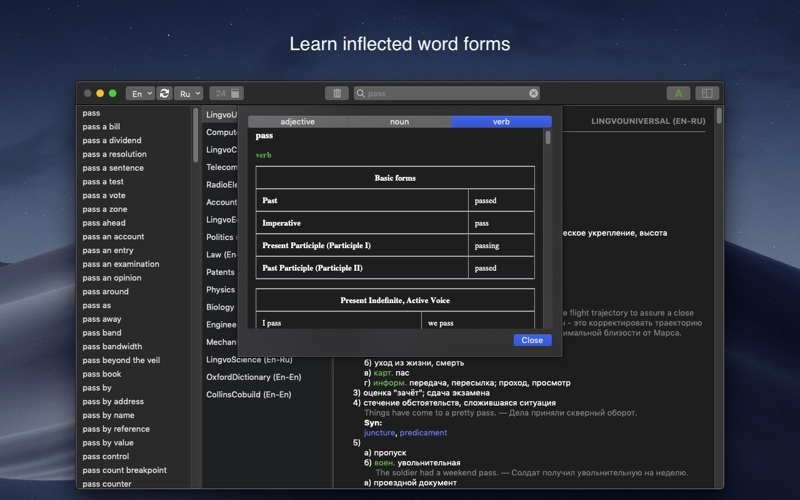 FEATURES AND BENEFITS: •	Get multiple translations and usage samples for each word meaning. •	Learn meanings of set expressions from general translation and idiomatic dictionaries, phrase books and dictionaries of English slang and colloquialisms. •	View synonyms and antonyms, grammar notes, verb forms, and cultural information. •	Look up accurate translations in different subject-based dictionaries (such as computer, engineering, law, medicine and many others). •	Listen to pronunciation of key words for English, Spanish, German, Russian and French recorded by native speakers. 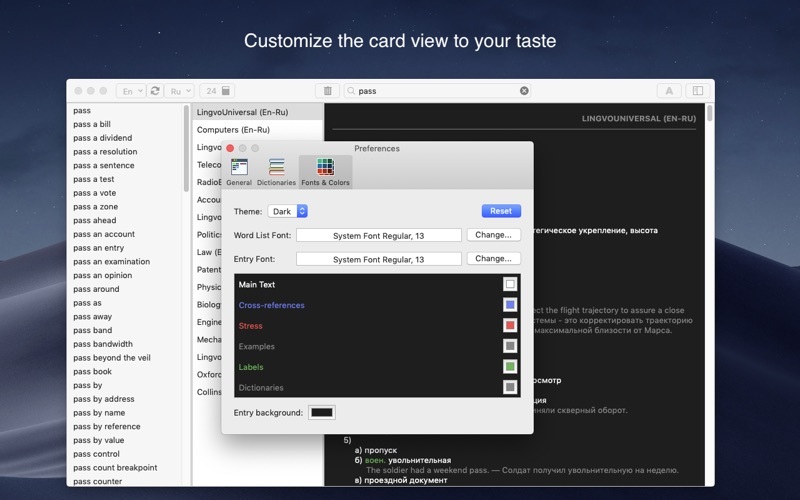 •	Get word translation quickly by using Services menu or shortcut (Command+\). 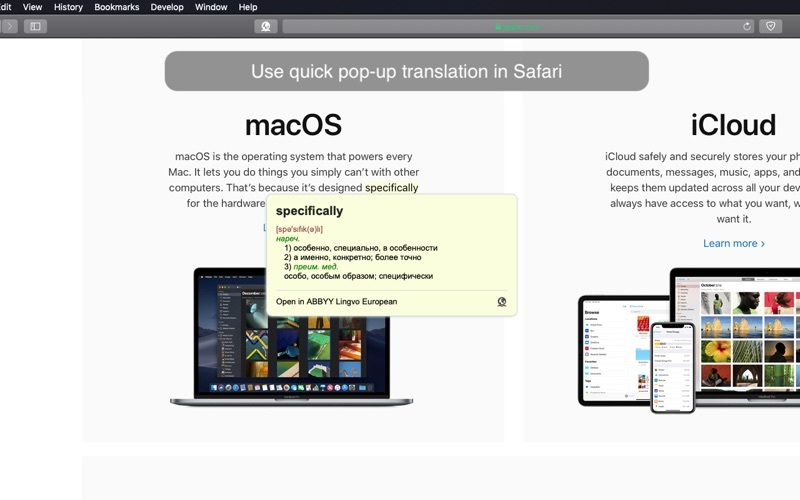 •	Use pop-up translation by using Safari Extension. DICTIONARIES: Translation from ENGLISH into French, Spanish, German, Italian, Portuguese, and back: •	French-English and English-French: 2 dictionaries with 44,000 entries •	Spanish-English and English-Spanish: 2 dictionaries with 44,000 entries •	German-English and English-German: 2 dictionaries with 43,700 entries •	Italian-English and English-Italian: 2 dictionaries with 44,000 entries •	Portuguese-English and English-Portuguese: 3 dictionaries with 68,000 entries Translation from RUSSIAN into English, French, Spanish, German, Italian, and back: •	English-Russian and Russian-English: 40 dictionaries with more than 2,000,000 entries •	French-Russian and Russian-French: 17 dictionaries with 980,000 entries •	Spanish-Russian and Russian-Spanish: 5 dictionaries with 145,000 entries •	German-Russian and Russian-German: 23 dictionaries with 885,000 entries •	Italian-Russian and Russian-Italian: 11 dictionaries with 705,000 entries Explanatory dictionaries: •	Oxford Dictionary of English. 355,000 entries •	Collins Cobuild Advanced Learner’s English Dictionary. 88,000 entries •	Russian: 3 dictionaries with 151,000 entries SUPPORT: https://lingvo-support.abbyy.com/hc If you have any questions or feedback, please email us at lingvo_support@abbyy.com and we will reply! In the latest update they removed pop-up translation. You pay almost $40 for an application. It’s not cheap, but the application comes with a set of useful features which justifies the purchase. Then suddenly one of these features (the most useful one for me) is removed for no reason. I am very disappointed. It’s equivalent to a money theft. I won’t be surprised if next they remove the ability to translate and we’ll have to buy another dictionary. I rarely write updates, but this time I have to. The app was not updated for ages, that means there were features, no new dictionaries or updates to existing ones, no speed improvements, ugly UI. Even a simple feature to arrange available dictionaries to have some on top is not possible. Of course, no pronunciations for EN dictionaries. Now it was updated, and it crashes A LOT. just try to search for “Märchenschloss” in DE-RU mode. Every time it crashes. I’ve bought it to use for EN, DE languages but now I think I’ve made a mistake. I should consider buying other solutions (from dictionary publishers which cost even less!). I hope it is a useful info for all considering this specific app as the main dictionary. The dictionary is awesome. Rarely I can’t find a definition. 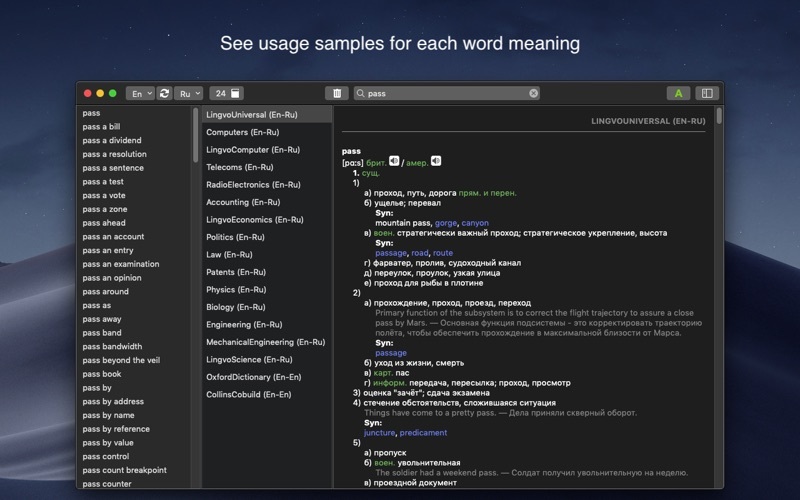 My everyday desktop tool to translate from English to Russian and vice versa. Thanks! if you slow why to show a splash srceen and block users? If your app starts forever why do you show a modal splash screen (habit from 90x) that blocks from using the computer? It works as a dictionary, but UI is so bad I can’t even imagine how you can make it worse. So OK, it’s formally functional, but you’ll hate it. I just purchased ABBYY Lingvo for my Mac and so far I am very impressed with the power of it. The pop-up translations when I’m reading Russian news online is extremely helpful. The dictionary lookup has been great so far, and I’m looking up a lot of words I cannot otherwise get a decent translation of. I’m just learning to use it, but so far it has been great. And it is working with El Capitan. Awful, clunky product that’s a scam. I bought this in 2013 thinking that Lingvo would send me free updates to keep my dictionary running with every new IOS release. Uh uh. They stopped updating last year’s release and just re-released a new software package. So this package might work with Yosemite but give it a year, it won’t work on any new IOS. This program would be very difficult to use, except that there are good macro programs available (like Keyboard Maestro). By making a macro that opens Lingvo, pastes text, and hit enter, I was able to make a good “lookup word” shortcut, which suddenly makes the program very helpful. This functionality should be included in Lingvo, though. Nevertheless, for value considering all the dictionaries, and for the fact that there’s really nothing else out there, it gets 5 stars. program on mac has never been a good as on windows. However before maverick lingvo worked in what they call cocoa type programs. 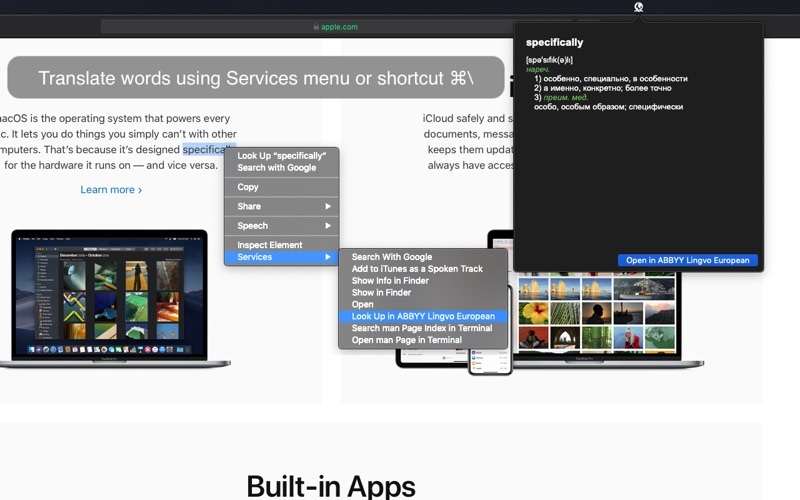 However, since maverick only works in safari. what is going on. would not have bought this program. feel cheated. have tried to relate problem to tech support but all i get is excuses and unintelligable emails. please fix this program and make it as good if not better than windows version.